Simon & Schuster/Paula Wiseman Books, 9781481401203, 40pp. Mary Garber was a pioneering sports journalist in a time where women were rarely a part of the newspaper business. Women weren’t even allowed to sit in the press boxes at sporting events, so Mary was forced to sit with the coaches’ wives. But that didn’t stop her. In a time when African-American sports were not routinely covered, Mary went to the games and wrote about them. Garber was a sportswriter for fifty-six years and was the first woman to receive the Associated Press Sports Editors’ Red Smith Award, presented for major contributions in sports journalism. And now, every year the Association of Women in Sports Media presents the Mary Garber Pioneer Award in her honor to a role model for women in sports media. Sue Macy is the acclaimed author of many books for young readers, including Miss Mary Reporting: The True Story of Sportswriter Mary Garber, which was on the Amelia Bloomer List and named a CBC/NCSS Notable Social Studies Trade Book, among many other accolades. Sue is also the author of Wheels of Change: How Women Rode the Bicycle to Freedom and Basketball Belles: How Two Teams and One Scrappy Player Put Women’s Hoops on the Map. A former editor at Scholastic, she lives in Englewood, New Jersey. Learn more at SueMacy.com. As a child in the 1920s, Mary Garber played tackle football with the boys in her Winston-Salem neighborhood and learned to love the many sports she watched with her father. Later, determined to become a journalist, she reluctantly worked as a society reporter until, during World War II, she took over the sports desk, traditionally “aman’s job.” Jackie Robinson became a role model for the young woman, whoendured her own discrimination at the ballparks: banned from press boxes and locker rooms, she was seated with the players’ wives. Garber earned areputation for fairness, covering games at local black high schools, adeparture from standard practice in the segregated South. She wrote her last article in 2002. In this well-researched picture-book biography, Macy introduces Garber as a person who followed her passion for sports despite hermother’s disapproval and did her job with purpose, integrity, and dignity. The narrative is swiftly paced, smoothly written, and filled with interestingdetails and quotes. Payne’s soft-focus, mixed-media illustrations feature beautifullydelineated period settings and a masterful use of composition for dramaticeffect. Best of all, even in crowd scenes, people are portrayed with perception, individuality, and humanity—especially Garber. A lively, memorable biography for youngerreaders. Macy's clear, anecdotal writing is backed with solid research and documented quotations. . . . A winning tribute to an important game-changer. This is a wonderful book with charming illustrations. As a fellow journalist whose also once wore credentials stating 'No Women or Children in the Press Box,' I don’t think Mary Garber can be championed enough! Mary Garber is an inspiration and role model to thousands, including me. This is the wonderful story of her remarkable and trailblazing life. *In the 1940s, Mary Garber entered the male-exclusive field of sports reporting, and Macy (Roller Derby Rivals) dives into describing the challenges she faced—such as her panic when reporting at a college football game and realizing there was no program to identify the players, or not being allowed to talk to the players in the locker rooms. After Jackie Robinson joined the Dodgers, Garber was moved both by Robinson’s baseball prowess and “quiet dignity in the face of taunts and jeers.” Payne’s mixed-media artwork blends a soft, hazy quality with a hint of caricature, emphasizing Garber’s diminutiveness, even as Macy makes clear the thoughtfulness, smarts, and determination she brought to her journalism. It’s an entertaining and accessible portrait of a generous-minded writer and a reminder of the value of telling people’s stories, whether pro player or soapbox racer. perfect touch of nostalgia, playing with perspective to further develop character. “Resources for all ages” are appended. 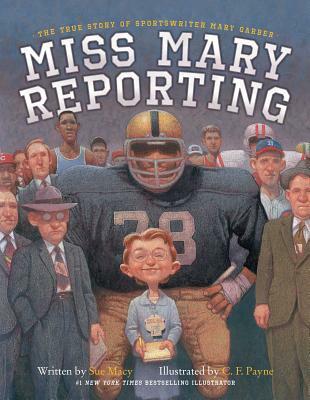 Gr2-4–Aheartfelt, informative, and thoroughly engaging picture book biography aboutgroundbreaking sports reporter Mary Garber (1916–2008). Garber became asportswriter at a time when there were few women in the field, when women werenot welcome in the press box, in the locker room, or on the sidelines. Her loveof sports, her fierce determination, and her independent spirit gave her thetools she needed to succeed. She became known for reporting on teams and peoplewho were out of the mainstream, athletes whom other sportswriters wouldn’t evenconsider, such as African American individuals and college teams. Heradmiration of Jackie Robinson inspired her to face her detractors with stoicismand grace and to go about doing the best job she could. In Macy’s adept hands,Garber comes to life, from her childhood antics on the football field to herimportant work giving a fair shake to kids and athletes she thought deservedmore attention. Payne’s mixed-media art lends itself well to the topic. Hispaintings fill the pages with movement and humor, and the characters’expressions draw the eye and complement the tone of the narrative. Pair thisentertaining biography with a few about other women journalists, such as NellieBly, for a more in-depth examination of an area that is often overlooked inchildren’s literature. VERDICT Anexcellent and welcome addition to any elementary biography collection. What did you like about the book? Born in 1916, little Mary Garber loved sports, and even became the quarterback of her football team despite her small size and the fact that she was a girl. Combining her love of sports with an affinity for writing led Mary Garber to a career as a sportswriter that ran from the 1940’s until 2002. This upbeat picture book biography tells her story, often quoting Garber or others in her life to demonstrate the kind of person she was. Garber’s big break came during WWII, when so many men went to war that the sports desk at her newspaper became available. Garber made it her practice to cover the games of the colored leagues as well as white. Simply by doing her job well, Garber broke through barriers holding back women from sports reporting and changed the tradition of keeping African-Americans out of her community’s sports pages. An Author’s Note provides a more details about Ms. Garber. End pages include a time line, resources for further information, a list of sources, and footnotes for each quote. Macy conveys well-deserved affection, respect, and admiration for her subject. To whom would you recommend this book? This would work well as a read aloud along with other books on the theme of “girl power,” the importance of following your dreams, or to demonstrate how one person can change the world. Should we (librarians/readers) put this on the top of our “to read” piles? Yes, it is very well done.